The Aspen Seminar – Nicole Collier Harp, Ph.D.
I’ve had two firsts today. I. I just arrived in Colorado for my first visit to the state. I’m here for The Aspen Seminar on Leadership, Values and the Good Society. Things get underway this evening and I plan to document my experiences while I’m here. II. I ate something called elk chili. I’d probably have called it stew rather than chili, but the important part here is the elk. I wanted something warm and filling, and while I don’t eat very much red meat, I felt adventurous. I give it a thumbs up. I enjoyed my small bowl and I think I’ll be satisfied for the next couple of hours. The view from my window. 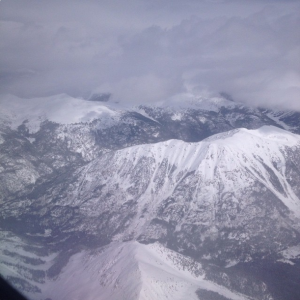 Initial descent into Aspen, Colorado. I’m looking forward the experience. There are 14 participants including me, and we have two facilitators. We were assigned several readings, and we’re meeting together in Socratic seminar-styled discussions to reflect and make meaning from the texts. We read everything from Aristotle’s Politics to the Declaration of Independence to King’s Letter from Birmingham City Jail. Some of the readings stretched me a bit, and I had some fun talks with Blue about a few of them. I’m open to what is sure to be an interesting, enriching experience.